I only have one New Year resolution: I will work on my game every day. Sometimes I can do a lot, sometimes I only have 30 minutes, but I intend to do this every day. Thanks to this, I have managed to make nice progress. I designed the weapons for both the fighter and the mech form. Although they are not 100% final, but it is a good starting point. The other big thing I decided is that I want every mission to start from the cockpit of the spaceship. That would be a nice place to get a briefing for the upcoming mission. 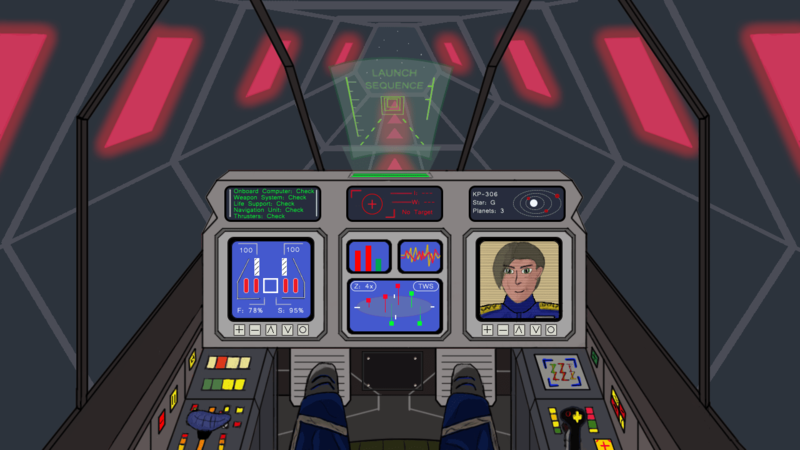 For that I have drawn a cockpit, which took a week to do. I’m no artist so I know it is not something spectacular, but I’m quite happy how it turned out. One problem I have is that I still couldn’t decide about the style of the graphics, or the size of the native resolution. Should I go for a more pixellated look, and set the native resolution to 640×360 (this looks better upscaled), or go for a 720p resolution, and a cleaner art. I have a disadvantage at drawing nice looking art, so I have to consider which is the one I can produce better art for. You can see two versions of the same cockpit, decide which one looks better for you. For the next few days I want to implement this cockpit briefing section into the game, with dialogue and text boxes. From there the player will be able to launch to the first mission.